Big Data & Data Science Blog: What does Big Data tell us about the way people move around Brazil's favelas? What does Big Data tell us about the way people move around Brazil's favelas? Brazil has seen its fair share of the world's media spotlight in the past year, with positive storylines around the success of the Rio Olympics, as well as more negative headlines about its continued problem with corruption in politics and the pressure of its economic crisis with almost 12% unemployment and stubbornly high inflation. In recent weeks, Brazilians have been protesting against the Senate's attempt to implement a 20-year spending freeze, which the United Nations has criticised for hitting the countries poor hardest, forcing even more people into economic hardship and into the favelas of Brazil. 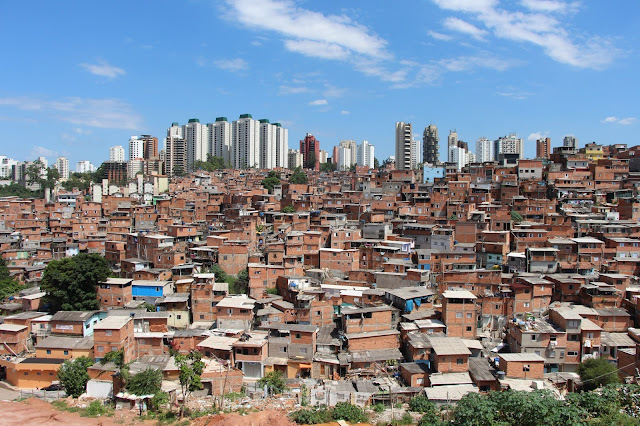 Although these urban populations are difficult to measure and monitor, according to official data from the Brazilian Institute of Geography and Statistics (IBGE), about 11.4 million people (6% of the population) live in 6329 favelas across Brazil. Unsurprisingly, many of these people work in low-income jobs, with irregular schedules and multiple work locations, making it difficult for local governments to find the right datasets to support their urban planning around public transport and infrastructure. Figure 1: Paraisópolis is one of São Paulo's largest favelas. Our LUCA team in Brazil are currently working with the World Bank and the University of São Paulo to see how our Smart Steps mobile data product would enable decision-makers to obtain better data in a more efficient way, using Big Data for Social Good. By gathering Smart Transport Card data, mobile app data and data from a range of telecommunications carriers, the multidisciplinary team are investigating the movements of people living in Paraisópolis, a favela area with approximately 55000 inhabitants in the city of São Paulo. Figure 2: Our partnership with The World Bank and the University of São Paulo. In our Smart Steps analysis, we looked at a total of 2 months of data at municipality level for the metropolitan area of São Paulo and intramunicipality level for the 96 districts of the city of São Paulo. In the district of Vila Andrade we divided the geographical area between Paraisópolis itself and the rest of the district. Our objective was to create an Origin-Destination (OD) matrix of trips between Paraisópolis and these other areas of the city - using anonymized and aggregated mobile event data to understand how people move around according to the day of the week and the time of the day - as well as providing insights on their demographic profile and the purpose of their journey. Luiz Branquinho, our lead Data Scientist in LUCA Brazil reflected on the project: "Difficulty in access and lack of security has always been a challenge for field research, especially in communities suffering from poverty and crime. It is great to see that technology can help us to overcome this barrier, providing quality data that allows quality urban planning for the whole city." "It is great to see that technology can help us to overcome the barriers of poverty and crime, providing quality data that allows quality urban planning for the whole city." Our Business Development Manager in Brazil, David O'Keefe said "Our Smart Steps platform gives us unprecedented insights into how people move in and around cities. This project was an important opportunity to collaborate with the World Bank and USP to better understand the unique demands for urban mobility in Paraisópolis, providing insights that can improve the quality of life for residents of the community."